Assembling transistors using DNA; clay supercapacitors. Graphene is a sheet of carbon atoms arrayed in a honeycomb pattern, just a single atom thick. It could be a better semiconductor than silicon – if we could fashion it into ribbons 20 to 50 atoms wide. Could DNA help? Stanford chemical engineering professor Zhenan Bao, believes it could. Bao and her team of researchers hope to solve a problem clouding the future of electronics: consumers expect silicon chips to continue getting smaller, faster and cheaper, but engineers fear that this virtuous cycle could grind to a halt. To continue on this cycle, a material is needed that will allow smaller transistors to be built that operate faster using less power. Graphene has the physical and electrical properties to become a next-generation semiconductor material – if researchers can figure out how to mass-produce it. Graphene is a single layer of carbon atoms arranged in a honeycomb pattern. Electrically, this lattice of carbon atoms is an extremely efficient conductor. The Stanford researchers believe that ribbons of graphene, laid side-by-side, could create semiconductor circuits, and given the material’s tiny dimensions and favorable electrical properties, graphene nano ribbons could create very fast chips that run on very low power. However, making something that is only one atom thick and 20 to 50 atoms wide is a significant challenge so the Stanford team came up with the idea of using DNA as an assembly mechanism. At this point, the assembly process needs a lot of refinement. For instance, not all of the carbon atoms formed honeycombed ribbons a single atom thick. In some places they bunched up in irregular patterns, leading the researchers to label the material graphitic instead of graphene. Even so, the process, about two years in the making, points toward a strategy for turning this carbon-based material from a curiosity into a serious contender to succeed silicon. With potential usage to power devices in extreme environments such as oil drilling, military and space, Rice University researchers have developed a supercapacitor that can operate at very high temperatures, a key ingredient of which is clay, an abundant and inexpensive resource. The researchers said the supercapacitor is reliable at temperatures of up to 200 degrees Celsius (392 degrees Fahrenheit) and possibly beyond. They said their intention was to completely move away from conventional liquid or gel-type electrolytes, which have been limited to low-temperature operation of electrochemical devices. 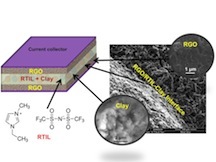 They found that a clay-based membrane electrolyte is a game-changing breakthrough that overcomes one of the key limitations of high-temperature operation of electrochemical energy devices. By allowing safe operation over a wide range of temperatures without compromising on high energy, power and cycle life, the Rice researchers believe they can dramatically enhance or even eliminate the need for expensive thermal management systems.